Jiu-jitsu.News: Ukrainian fighter became the European Jiu-Jitsu champion! Ukrainian fighter became the European Jiu-Jitsu champion! Ukraine is known for its strong sportsmen. And it concerns not only swimming and boxing sport branches. 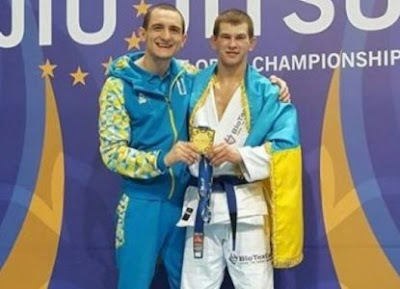 This year, Ukrainian fighter Yaroslav Blazko has won the gold medal during the European Jiu-Jitsu Championship. It took place in Lisbon, Portugal. Sportsmen really have a great support. Behind each victory there are hard trainings, instructions by coach and also sponsorship. Ukrainian athletes went to the European Jiu-Jitsu Championship 2017 with the help of their sponsor, center for human reproduction “BioTexCom”. “This trip was paid by the BioTexCom. Our sponsor has paid everything from the flight expenses to subsidence allowance”– the athletes commented. Now Ukrainian athletes prepare for the Abu Dhabi 2017 World Professional Jiu-Jitsu Championship. It will take place in Abu Dhabi, UAE. Ukrainian fighters are self-confident and hope to place high.